St Johnstone have signed David McMillan after the striker left Dundalk, with manager Tommy Wright backing him to make a scoring impact in Scotland. The 28-year-old, who has signed a two-and-a-half year contract, scored 17 goals this season as Dundalk finished runners-up in the League of Ireland. "He's scored all types of goals, left foot, right foot, headers," Wright said of the free agent. "And he's done it at various levels, including European club football." Dublin-born McMillan, who will be free to play in January, began his career with UCD before spells with St Patrick's Athletic, Sligo Rovers then Dundalk. His goals tally reached double figures in each of his four years with the Lillywhites, including seven at various stages of the Champions League and Europa League. 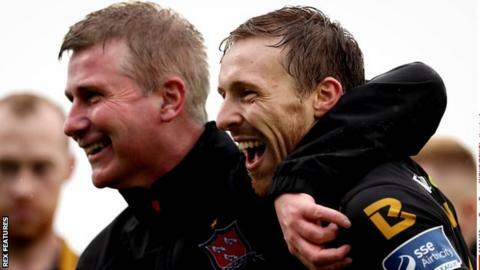 He also scored the opening goal as Dundalk, managed by former Dunfermline Athletic boss Stephen Kenny, beat Shamrock Rovers 3-0 to lift the League of Ireland Cup in September. "David's a player I've known for quite some time and I knew he was coming out of contract and felt the time was right to make a move," Wright told his club website. "He has experience of a higher level than just League of Ireland, he's a hard worker, a good age and without doubt capable of making the step up." McMillan's signing came as midfielder Kyle McClean agreed a one-year contract extension with St Johnstone. The 19-year-old from Belfast joined the Scottish Premiership club this summer after leaving Nottingham Forest. McClean, who made his debut and only first-team appearance so far in a 4-0 defeat by Celtic in November, is now contracted until the summer of 2019. The Northern Irishman said: "I'm pretty much where I would have hoped to be after six months - settled in and in and around the first team. "But it's important that I kick on in the next six months and try and break into the team and get Premiership game time under my belt."